If using achuete water, soak 1 tbsp.achuete seeds in water for 30 minutes. Squeeze seeds between your thumb and finger tips until the water turns red. Strain and set aside. Use the achuete water together with or after pouring the broth (see #2 instruction below). Or heat 2 tbsp. oil, sauté achuete seeds until oil turns red. Discard seeds. Use oil for sautéing rest of the ingredients. 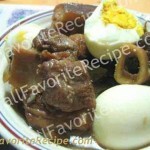 Place oxtail (or pork hocks, if using) in a large pot. Add enough water to cover. Bring to a boil, lower heat and simmer for 1-1/2 hours or until tender. Remove from heat. Save some broth for other uses. Set aside. In a skillet, heat oil. Stir in achuete powder until well blended. Sauté garlic and onions in red oil. Add boiled oxtail (or pork hocks) and 2 cups broth, simmer for 15 minutes. Season with salt. Stir in peanut butter (or a mixture of 1/3 cup toasted rice flour and 1/2 cup ground toasted peanuts) until well blended. Stirring and simmer for 3-5 minutes. Add vegetables. 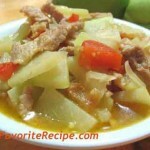 Simmer and cook for 10-15 minutes or until vegetables are tender, stirring occasionally. Correct seasonings. Serve hot with rice and bagoong, plain or sautéed. For a meatier Kare-Kare, add 1/2 to 1 lb. stewing beef to oxtails (or pork hocks). Simmer them together until tender. To brown roast, do it on high heat so as to seal in the juices immediately. If the heat is not hot enough, the meat will stew, releasing its juices and it will become tough. A cast iron skillet sears meats without much oil.